SellingRestaurants says SELLER MOTIVATED...PRICE REDUCED...SAVE $23K!! "You don't need much dough to own your own bakery"! Are you tired of being furloughed, laid off or downsized? Here is the perfect opportunity for you to own and run your own business. 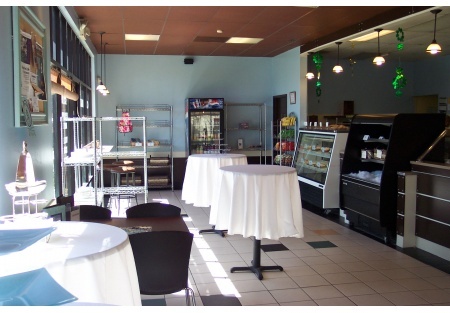 Located in the City of San Dimas, Los Angeles County, this family run bakery has quickly built a reputation for exquisitely designed and scrumptious tasting cakes for all occasions, weddings, birthdays etc. Although the business is less than a year old, the owner states they are making a profit! This is to be confirmed by the buyer, as Selling Restaurants does not verify income. Located street front, on the major east/west street in the city, there is busy auto traffic and great visibility. The dining and kitchen areas total 2,352 SF and the rent is an unbelievable $1.09 a sq ft, that's $2,572.00 including nnn!! Develop additional streams of revenue by expanding morning hours, adding more menu items, on premise birthday parties, baby and bridal showers, catering drop offs, wholesale contracts to mention a few. Or change the concept to a sub shop or deli. The sellers are motivated as they want to relocate out of state, so BRING YOUR OFFER! If your interested in seeing more pictures and getting the address, click on the orange buttons below, and follow the prompts to register at no cost. Additionally you will be considered a preferred buyer, and receive periodic updates on new listings and price reductions.This is a Business Intermediaries, Inc. listing. Add Additional Menu Items For More Profit! On Premise Birthday Parties, Baby Showers etc. Mexican/Salvadoran - Busy Street - Low Rent - Low Price!